Welcome to the Crazy Crafters Blog Hop for February - we're all finding inspiration in the beautiful creations of Patty Bennett and CASE-ing (Copy And Selectively Edit) one of her projects AND, even more exciting, she's joining us on this blog hop! Thank you, Patty! You may just be starting the blog hop here at my blog - Stephanie Fischer, The Crafty Thinker - or you may have come from the person before me in the list. If you get off track at any time, the full lineup below will help you to move along from blog to blog so that you see all of the projects. I really love this cute card of Patty's! She has very generously provided tutorials and videos on how to do this fold here. I did change the dimensions just a little to suit the A4 cardstock. This is my version. 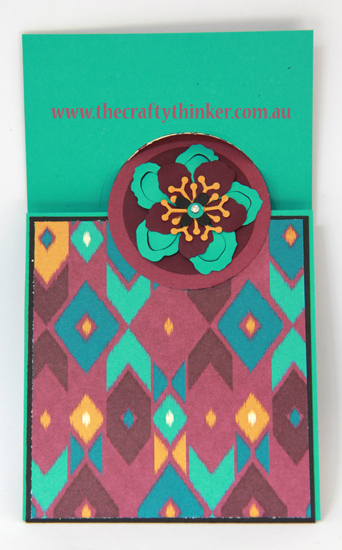 I used Bermuda Bay and Black cardstock to make the fun fold card and decorated it with a selection of papers from the Bohemian Designer Series Paper. 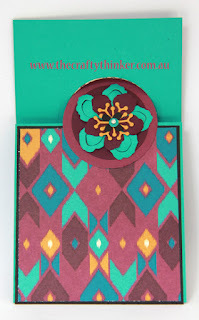 I cut circles from Rich Razzleberry and Blackberry Bliss cardstock and topped them with a Blackberry Bliss, Bermuda Bay and Delightful Dijon flower. The flowers were all cut with the gorgeous Botanical Builder Framelit dies. I stamped a greeting from the Birthday Blooms stamp set and cut it out with one of the Project Life Cards & Labels Framelits. 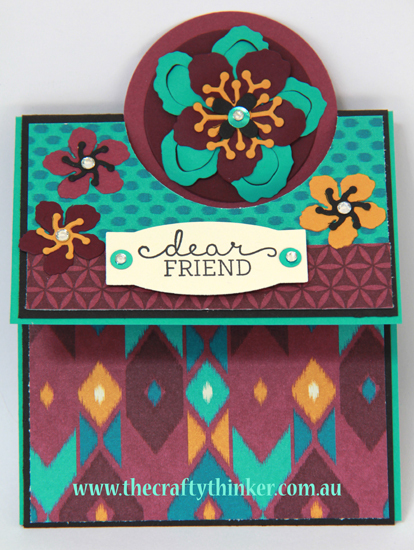 I removed a few sequins from the Bermuda Bay Sequin Trim and used them to highlight the large flower and the greeting. Then I added a few Rhinestone Jewels for a bit of sparkle. The inside of the card hides a little surprise. There's another flower made with the Botanical Builder dies and some matching flowers stamped with the Botanical Blooms Stamp set. The greeting is from Happy Birthday, Everyone. More flowers hidden inside the card!